More than ever, we live in an online, Google society. While the importance of having a high-quality website seems self-evident, many DJs still employ mediocre websites. Surprisingly, some DJs operate without any website. A mediocre website costs a DJ thousands of dollars in the form of foregone bookings. Building a quality website is one of the highest return on investment projects that a DJ can implement. 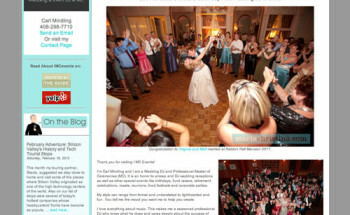 Looking back on the history of my own DJ service, creating a professional website was the one decision that helped catapult my business to the next level. Our original www.ambientdj.com website was created by a college student in 2003. In hindsight, it was laughable and violated all of the principles that I am about to share. A website is a conversion tool for your business. A prospective client wants to learn more about your services. Your website is an online storefront that should increase a prospect’s interest to the conclusion of (a) scheduling a consultation, or (b) booking your services. If your website fails to capture their attention, then a prospect will quickly click off your site to check out a competitor. Listed below are seven tips for a successful DJ website. These tips were developed based on my years of experience and trial-and-error. The recommendations also reflect the savvy recommendations of my professional web designer who understands not only the technical side of web design, but also the business side of a website; that is, sucessfully using a website to convert prospects into clients. First Impressions Count. The most important element of a successful DJ website is the initial impression when visiting the homepage. First impressions count for a lot. the website offer a clean and professional look or does it resemble a do-it-yourself hack job? The colors that you use and images selected will instantly create a perception of your brand with the viewer. Who is your target market, and does the feel of your website appeal to that target market? To help achieve a professional looking homepage, I highly recommend retaining the services of a professional web designer. Ask friends, family and DJ colleagues to offer their first impressions of your website when visiting the homepage. Another recommended exercise is to visit the homepages of random DJ companies. You will quickly gain a sense for the variety of “feels” that a website produces. Use Professional Images. Related to the idea of positioning yourself as a professional company, you need to use professional images for your website. Do not use grainy cellphone photos taken at a family party in a dimly lit VFW Hall. You are highly recommended to invest $500 or so in an SLR camera so that you can take beautiful images for your website and marketing efforts. Another power strategy is to link up with one of your photographer networking partners, and ask their permission to use their photos for your website. In return, you can give them a credit and otherwise promote their business. One caveat about professional photography – I do not recommend using stock photography as the photos and scenes tend to look fake. What images should you use? In general, select photos of good-looking people having fun in beautiful venues. Focus on party-goers having the time of their lives and limit photos of you and your DJ gear. Prospects are interested in the fun that they can have if booking your services! Keep Copy Crisp and Reader Focused. You are well advised to keep your website copy (i.e. text) crisp and conversational. Long rambling paragraphs should be avoided. Remember, the end goal of your website is not usually to sell the job, but to get the prospect to call or email you for more information. Whet their appetite, and keep your website in the minimalist zen spirit. Another recommendation is to write specifically to your target customer rather than try to be all things to all people. Avoid being the “DJ For All Occasions” who is the jack of all trades and master of none. Be more precise so that you can connect with your ideal client. For free tips and webinars about how to write compelling website copy, check out Michele Sumer’s website www.writtenbysumer.com or hire a professional like Stacy Zemon (http://stacyzemon.com). Prominently Display Contact Information. Your phone number and email address should be prominently displayed on your homepage and every single page of the website. A prospective client should never have to search for your contact information. If becoming frustrated, they will click off your site. As common sense as this tip sounds, many websites do not prominently display contact information, and a few websites even limit the contact options to an online form. A related tip is incorporating more “calls to action” on your website. For example, next to your contact information, try using a phrase like “Call Us Today to Schedule a Free Consultation” or “Call Today to Book Your Party!” Calls to action will increase your conversion rates. Paint a Picture with Words, Photos and Videos. Ultimately prospective clients are interested in the quality of your services and what their party will look, sound and feel like. Make it easy for them by including on your website elements such as photos, video footage/video logs, professional headshots and video demos of DJs, links to online music mixes, and well-written website copy describing your services. Include Testimonials. According to Google, “70% of Americans say they look at reviews before taking the next step to conversion.” Accordingly, make it easy for prospects by 1) including testimonials from past satisfied clients (I recommend a “Testimonials Tab” on the homepage), and 2) providing links or widgets to your online review sites so that prospects read more reviews. Address the Price Issue. “How much?” is a question at the top of every shopper’s mind. There is much debate in the mobile DJ industry about whether a company should list their prices online. At a minimum, I recommend that DJs list prices in a range or include a simple statement like “prices starting at…..” The Millennial generation prefers online transparency. 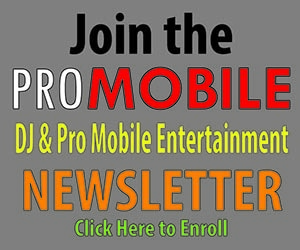 The mobile DJ industry sometimes has a bad reputation for aggressive sales practices pushing upgrades and big packages. Some prospects are intimidated to set up an appointment with a DJ company that doesn’t list prices because they fear being pressured into purchasing a big package at a consultation. On the flip side of the coin, those companies who list packages and prices may lose the opportunity to book a consultation that will provide the time to justify their value and promote upgrades that result in a higher average sales price. As a matter of disclosure, I’ve always published our company’s packages and prices online, and this system has served us well. As a result, I don’t field calls from budget shoppers who can’t afford our fees. We receive many positive comments from clients who appreciate us sharing our prices and being consumer friendly. And finally, publishing pricing information online hasn’t precluded us from selling higher end packages. Follow these seven tips, and you can expect to enjoy a higher percentage of conversions from your website traffic. Don’t be penny wise and pound foolish by thinking that you do it yourself or coast by with a lackluster website. A professional website will be an engine of growth for your company and has the potential to put tens of thousands of dollars of additional profits into your pockets. Need a second set of eyes to evaluate your website? Contact me anytime at gregg@ambientdj.com and I’d be happy to take a look at your site and offer my feedback.